Absent reform, by the early 2030s, Social Security could be insolvent, that is, unable to pay full benefits. As the U.S. population has aged, the number of active workers per retiree has declined significantly, resulting in less revenue per retiree. Without legal immigration of working-age people, the impact of demographics on our retirement system would be worse. Social Security — the anti-poverty program for the elderly and disabled — has evolved into a critical component of retirement security for workers. Yet changing demographics have placed huge pressure on this social insurance program. Without policy intervention, Social Security may be insolvent by the early 2030s, and recipients could see reductions in benefits of 20% or more. The good news is that solutions are available to us and ready to implement — we just need the political will to enact them. About 10,000 Baby Boomers reach age 65 every day. In reflection of this aging trend, the ratio of workers paying into the Social Security system through FICA taxes relative to the number of retirees has been on the decline for years. In addition, the program’s funding formula is based on decades-old mortality rates. Longevity has increased substantially over time and retirees today are living longer than presumed in earlier calculations. National Center for Health Statistics estimates found that individuals who turned 65 in 2000 may expect to live another 17.6 years. That projection is expected to rise to 20.3 years in 2020. As a result, the number of retirement-age individuals is growing, at the same time that fewer workers actively paying into the system. Just two years ago, these pressures led to a cash-flow deficit for the Social Security Administration (SSA), with the system paying out more than it took in from FICA taxes. To cover the shortfall, the SSA uses special bonds from its trust funds. When it submits them to the Treasury Department for payment, the Treasury must pay the debt from general revenue or new borrowing. Unless current law is changed, today’s more than $2.8 trillion in trust fund assets will eventually diminish to zero, and the demands on the Treasury will grow. One bit of good news is that the United States has more promising long-term demographic trends than many of its trading partners because of a higher birth rate and greater legal immigration. More than one million individuals per year immigrate, a greater amount than in the rest of the developed world. 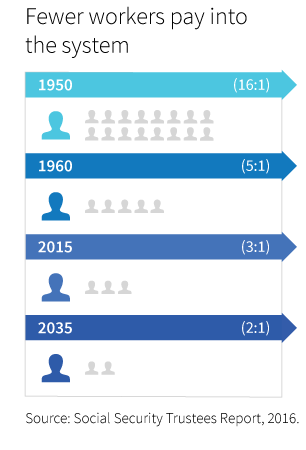 As a result, in 2020, the working-age population in the United States will still be growing and we will be moving toward a total population of more than 400 million people. In contrast, the populations of China, Japan, Russia, and much of Europe will be in decline by 2020. Even with that positive note, the SSA is still under stress from an aging population. Social Security remains an important pillar of the public retirement system. Most workers rely on Social Security for all or part of their income in retirement, making it critical that we strengthen this important piece of the system. This year, some 62 million Americans will receive benefits. Nearly 90% of seniors receive benefits and Social Security represents 33% of their income. To keep the promise of Social Security, help ensure a dignified retirement, and lessen the risk of poverty for seniors, it is imperative that we maintain the solvency of Social Security.